Despite all our technological achievements, humans still spend a lot of time waiting around for trains. Add a stiff winter breeze to the injury of commuting, and you’ve got a classic recipe for misery. [George Barratt-Jones] decided to inject some warmth into this scene by inviting people to knit a free scarf for themselves by riding a bike. All a person has to do is ride the Cyclo-Knitter for five minutes and marvel at their handiwork. By the time the scarf is finished, they’ve cycled past being cold, and they have something to hold in the warmth. Cyclo-Knitter is essentially an Addi Express knitting machine being belt-driven by a stationary bike. Power is transferred from the bike through large, handmade wooden gears using old bike tire inner tubes as belts. [George] built a wooden tower to hold the machine and give the growing scarf a protected space to dangle. We love the utility of this project as much as the joy it inspires in everyone who tries it. Check out their scarves and their reactions after the break. We haven’t seen people this happy to see something they weren’t expecting since that billboard that kills Zika mosquitoes. [Eli Skipp] wrote in to share a project she has been working on bit by bit, for over a year – an LED VU meter scarf. The project was originally going to be built using a custom PCB, but no matter how long she spent troubleshooting the piece, it just wouldn’t work right. She eventually broke down and purchased a VU meter kit, which worked out quite a bit better than the homebrew version. The VU meter circuitry is tucked away inside the scarf as she shows in the video below. 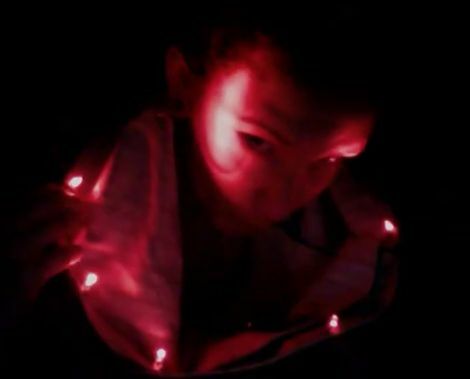 The LEDs are connected using conductive thread sourced from Lamé Lifesaver, which she says is far more durable than other threads she has tried. After originally testing the VU meter, she was unimpressed by the output of the LEDs, so she swapped them out for brighter ones, which look much better. It looks like it works quite well – we definitely dig the idea of a scarf with a built-in VU meter, even if it was partially built from a kit. Continue reading to see [Eli] give a quick demonstration and a rundown of the scarf’s construction.